Located 5 miles south of Saginaw, Price Nature Center is a 186-acre woods surrounded by the agricultural heart of Saginaw County. This park offers a variety of amenities including picnic area, children’s playscape, a pavilion that is available for rent, even a group campground but most visitors come here for the solitude of the trees, particularly in fall and spring. The land was originally donated to Michigan State University by James C. Price who in 1940 wanted to “assure its continued use to the public” and serve as a memorial to his family. 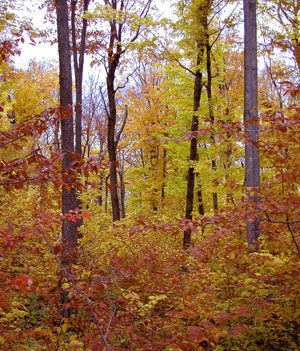 Price Memorial Forest was used by the MSU Forestry Department for field studies and experiments as well as by locals for camping and picnicking. 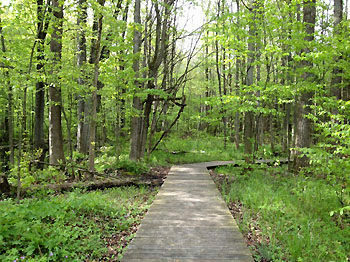 In 1979, the area was passed onto Saginaw County and in 1981 Price Nature Center, dedicated to preserving the mature beech-maple forest that covers most of the park, was open to the public. A sluggish creek splits the Saginaw County Park in half with nearly 3 miles of foot paths on both sides. The trail system is composed of three short loops. From the picnic area, the White Oak Trail is a 1.1-mile loop with a crossover spur that shortens it to 0.9 miles while the Cottonwood Grove Trail is a 1-mile loop. Deer Run Trail is a 0.7-mile extension off of Cottonwood Grove. A series of benches, wildlife blinds and an observation tower line the paths. 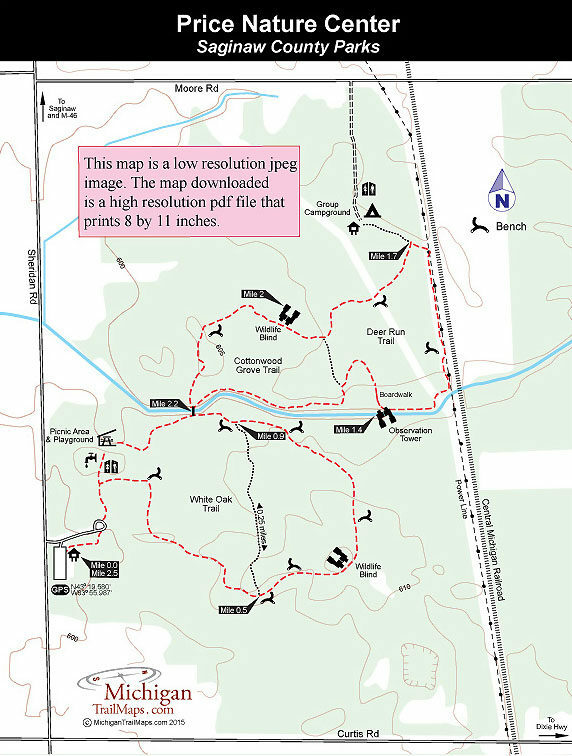 The hike described below is the outside perimeter of the trail system that begins from the trailhead in the parking area. This loop is still only a 2.5-mile hike and makes for an easy and enjoyable outing along extremely level trails. In the spring, the woodland flowers can be impressive; in the winter cross country skiing is a popular activity when there is sufficient amounts of snow. From the trailhead in the parking area, a spur leads to the restrooms in the picnic area where a sign marks the beginning of the White Oak Trail if hiking it in a counter clockwise direction. Within 0.6 mile you pass two benches, a giant white oak, the junction to the crossover spur and arrive at a trailside shelter. The shelter sits on a small rise and at dusk in the spring or fall would serve well as a wildlife blind. The second junction to the crossover spur is reached at Mile 0.9 followed by the junction to Cottonwood Grove Trail. Cross the foot bridge over the stream and head east (right) on the north bank to continue the hike. Cottonwood Grove follows the north bank until it swings away to its junction with Deer Run Trail. Along Deer Run you use a long boardwalk to cut through a wet area and then reach the observation tower at Mile 1.4. Built on the edge of the stream, the low tower doesn’t offer any grand views but does allow for quiet contemplation and possible wildlife viewing in spring and fall. Beyond the tower Deer Run swings north to parallel a power line and the Central Michigan Railroad briefly before dipping back into the woods and reaching the junction to the group campground at Mile 1.7. You return to the Cottonwood Grove Trail at Mile 1.9 and then pass the second trailside shelter before entering a low-lying wet forest featuring some large cottonwood trees. At Mile 2.2 the trail arrives at the foot bridge across the creek. Head to the junction south side of the stream and head west (right) to return to the picnic grounds and then the parking area. Within Price Nature Center is a picnic area with restrooms and drinking water, a children’s playscape, a pavilion that is available for rent and a group campground. 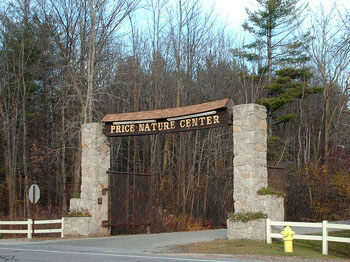 There is no fee to hike or ski at Price Nature Center, which is open from 8 a.m. to dusk year-round. Depart I-75 at the Bridgeport (exit 144) and head west on Dixie Highway for 0.6 mile to Fort Road. Turn south (left) on Fort Road for 1.5 miles and then west (right) on Moore Road for 2.5 miles to Sheridan Road. The park entrance is just to the south on the east side of Sheridan Road. Contact the Saginaw County Parks and Recreation Commission (989-790-5280; www.saginawcounty.com/parks).